Today Forgotten Stories makes but the briefest of stops at a fashionable party in 1879. On the menu for entertainment, soap bubbles. 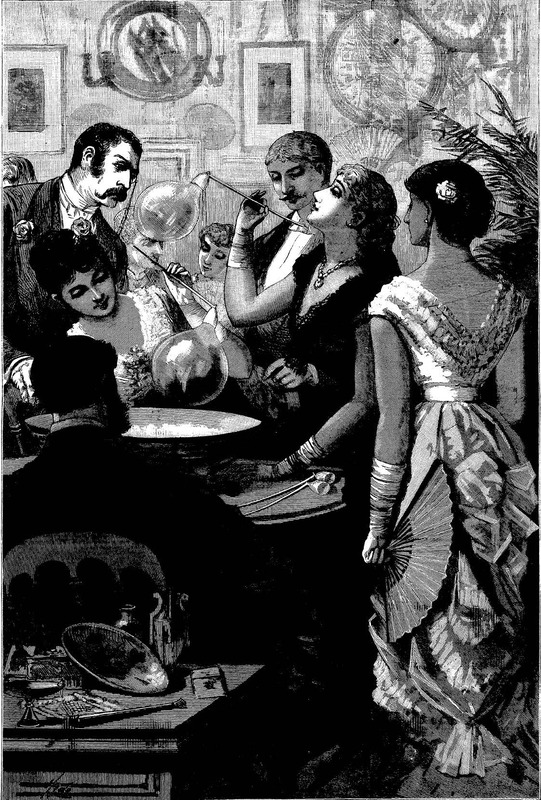 According to a reporter at Frank Leslie’s, “the rosebuds of the bouquet of Society have, under the nod, beck and wreathed smile of Fashion, turn soap bubbles to account, and have placed them amongst the glittering nothings that constitute the amusement of the blasé upper ten.” Translation: All the cool rich kids were having soap bubble parties. Ed. Note: A brief comment on the picture above. First, the gentleman’s mustache on the left is particularly neat. Secondly, look at the young lady on the right, holding the fan. I’ve heard of wasp waisted women, and the effects of corsets, but her waist must be all of 22 inches.